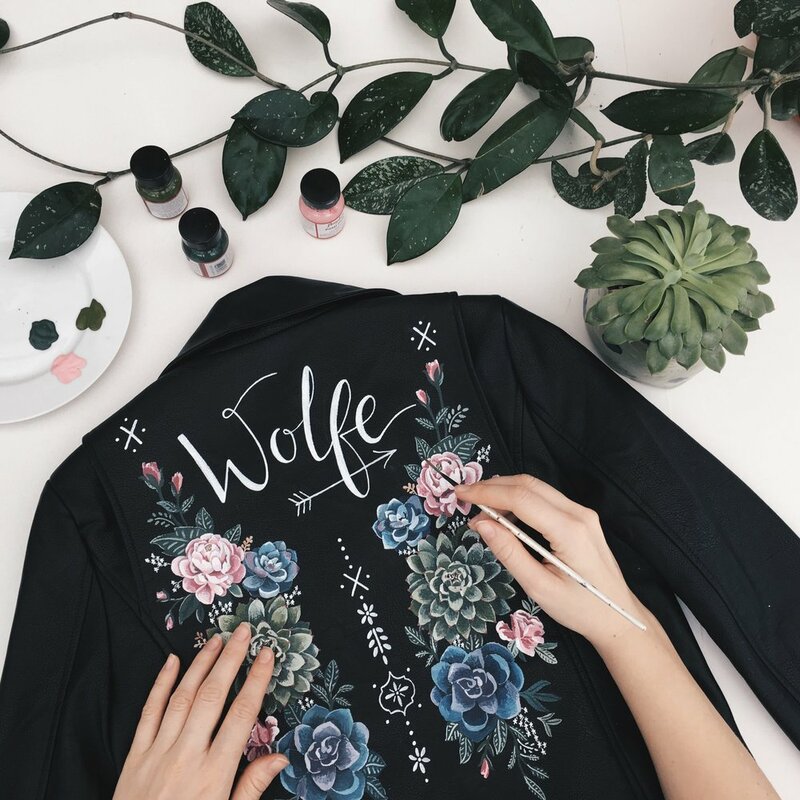 Founded by Illustrator Rosie Harbottle, Wolf & Rosie hand paints botanical inspired designs on leather jackets and paper goods. The perfect accessory for all you boho babes and brides to be, who want a special custom piece on their big day. They also provide colorful, bespoke designs for stationery, cards or special gifts by using watercolor and ink. 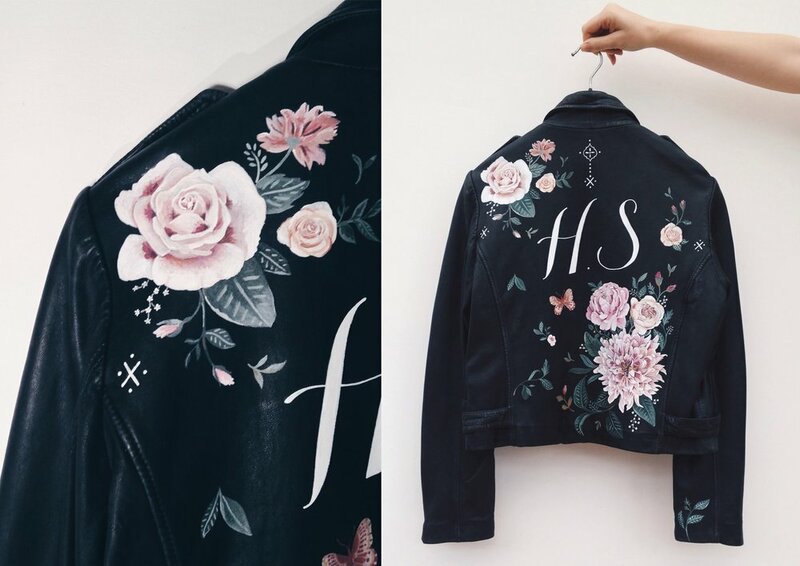 We did an interview with Rosie, who strives to create treasures you want to keep and remember forever. 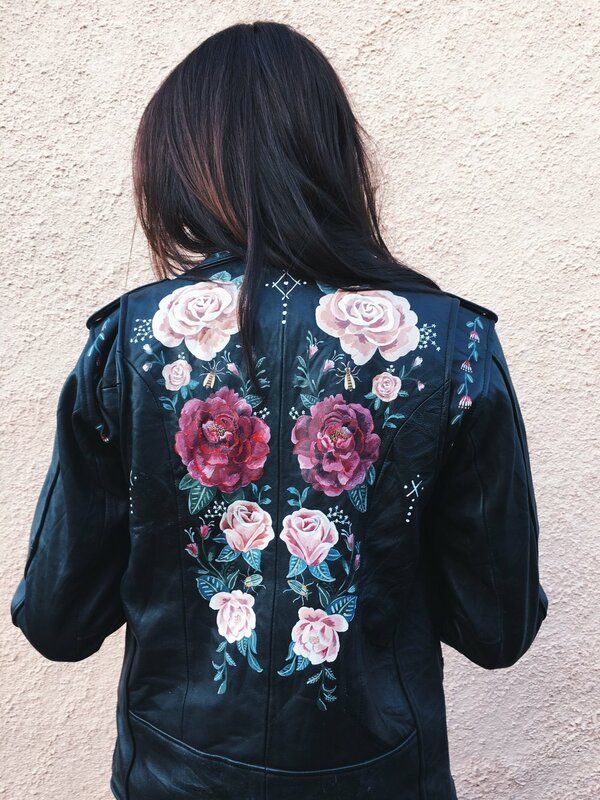 Since the very first moment, I was fascinated by the filigrain, feminine paintings on the leather jackets, which normally appear more heavy and masculine. I never saw that kind of combination before. What triggered the idea of creating this kind of fashion, especially for brides? Since when have you been drawing and when did you realise you want to become an illustrator? I come from a very creative family, so I've always had an interest in art. 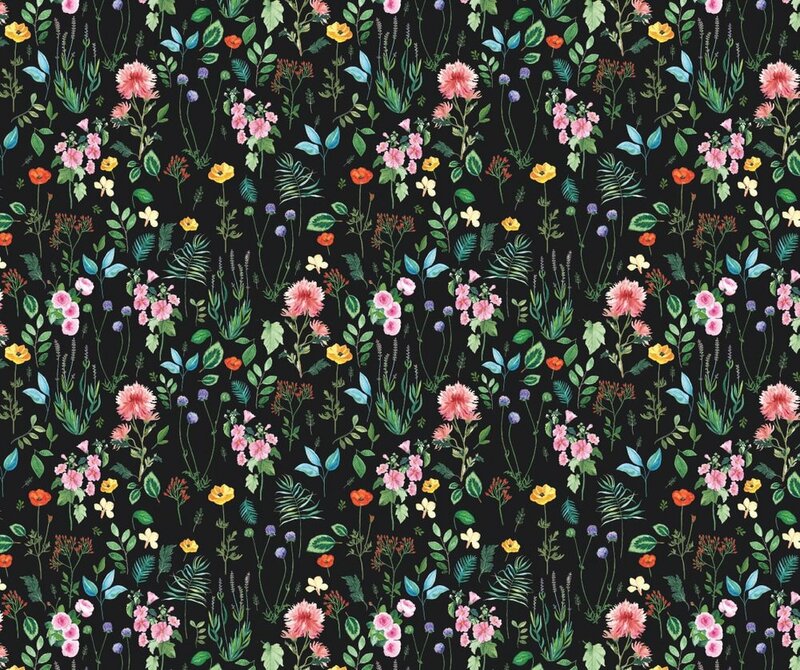 My mother studied fashion design and collected textiles which must have had an influence on me as I adore finding new prints and patterns wherever I go. I actually thought I wanted to do Graphic Design and completed a year of a Degree course before realising that I craved playing with paints and experimenting. So I switched to an illustration course which was the best move I ever made! A lot of your illustrations seem decadent and bright. Do you also like dark, gloomy things? Yes, of course, we all need balance, but I've always been drawn to beautiful colours and bright prints, I often travel to Morocco where I'm so inspired by all the gorgeous colours and textiles which I think feeds a lot into my work. I also draw a lot of inspiration from folk art, when I travelled to Mexico last year we had to do a huge detour just so I could purchase some gorgeous Otomi art. I saw a lot of foxes and wolves in your paintings. What message do you want to convey through these animals? 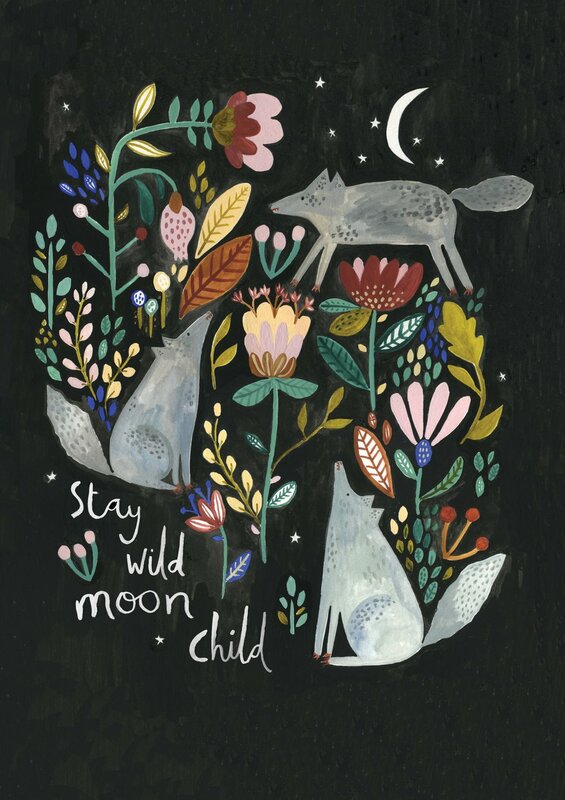 I've always been drawn to these mysterious creatures, especially wolves. I'm not sure if I'm trying to convey a message other than to provoke your inner wild. Whatâ€™s your favourite city to travel to and what memories did you make there? I work with Boutique Souk - a luxury wedding and events company based in Marrakech which means I get to travel there often. I'm obsessed with Moroccan style and design, the colours, the patterns and I always come home feeling so inspired and invigorated by the magical and otherworldly vibe of Morocco. Favourite piece in your wardrobe? A gorgeous two piece from Zulu & Zephyr who are an awesome Australian label, the tropical print is to die for but sadly there's not many opportunities to wear it in England. Flowers, sometimes I think I should have been around in the sixties - flower power an' all. I never get tired or hydrangeas and I'm quite obsessed with Icelandic poppies at the moment. With that said, succulents are more abundant than flowers in my house and they can produce some incredible blooms! I don't have just one role model but I'm constantly inspired by so many women (and men) who aren't afraid to put in hard work to live the life they want. We live in an incredible time where so many opportunities are available to us. Instagram and social media in general, if used in the right way, can open up so many doors and allow you to connect with so many inspirational people. Do you have any plans for upcoming collections yet? There's always projects and collaborations in the pipeline, but I'm particularly excited about collaborating with Rewritten on a project this Summer. So look out for that! Buy their beautiful products here and check out Wolf & Rosie's Instagram.